Contemporary Art Movement Of AP - A Group Exhibition of Paintings is an event that took place between 20-Apr-2006 and 28-Apr-2006 in Hyderabad. This is art for, Times' sake! Times Hyderabad Festival has come up with a group exhibition featuring prominent artists of Andhra Pradesh. 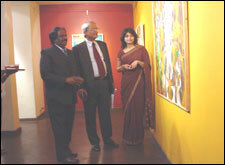 The exhibition represents modern Andhra art ranging from Guntur to Vizag. Works of artists like P T Reddy, Vidya Bhushan, Paidi Raju and Krishna Reddy are on display. In all, there are 35 artists, mostly from Hyderabad, who have put up their artwork in the gallery. Please contact Sushil Rao of Times of India at 2335-5335 extn 4325 or the Art Gallery at 3061-2345 for further details. Be the first to comment on Contemporary Art Movement Of AP - A Group Exhibition of Paintings! Just use the simple form below. fullhyd.com has 700,000+ monthly visits. Tell Hyderabad what you feel about Contemporary Art Movement Of AP - A Group Exhibition of Paintings!